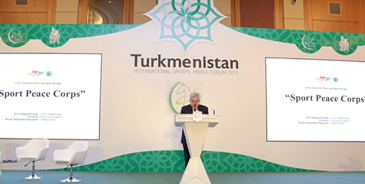 WTF President Chungwon Choue at the 2015 Turkmenistan International Sports Media Forum (TISMF). 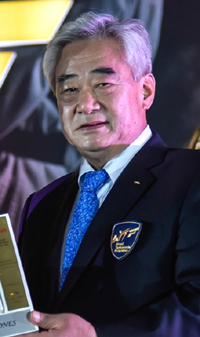 ASHGABAT, Turkmenistan; April 3, 2015 — World Taekwondo Federation (WTF) President Chungwon Choue today called for the support of the IOC, the U.N. and International Federations to help make the Sport Peace Corps a reality during a speech at the 2015 Turkmenistan International Sports Media Forum (TISMF). The WTF are looking to build on the success of the WTF Taekwondo Peace Corps which were first launched in 2008 to instill self-awareness and discipline in young people. Since 2008 around 1,300 volunteers have been dispatched to over 100 countries worldwide. A New Vision for Peace and Sport through "Sport Peace Corps"
I am honored to be speaking before you at this prestigious 2015 Turkmenistan International Sports Media Forum as president of the World Taekwondo Federation. On behalf of the entire global taekwondo family, I want to express my heart-felt appreciation to each one of you for your support for taekwondo and the World Taekwondo Federation. Let me begin today by telling you a story. It is a story about the dream of my late father, Young-seek Choue. My father, who had experienced the physical and moral devastation of the 1950-1953 Korean War, was the founder of Kyung Hee University in South Korea - an institution that he hoped would assist the country’s physical and moral rejuvenation. He later became president of the International Association of University Presidents, or IAUP. It was in that position that he delivered a keynote speech, entitled "The Great Imperative: Peace is More Precious than Triumph," at the 6th Triennial Conference of the IAUP in Costa Rica in July 1981. The encouraging response he received spurred my father to think deeply about how peace might be delivered. Hence, he embarked on a whirlwind program of travel, visiting several countries for discussions with heads of state. He was granted several meetings with the secretary general of the United Nations. After collating his thoughts and experiences, I assisted my father in drafting a resolution for the "International Day and Year of Peace." As South Korea was not a member of the United Nations at that time, the resolution was sent to the U.N. by the then Costa Rican president and the country's ambassador to the U.N. Remarkably, just four months after my father’s speech, the resolution was voted for without discussion at the U.N. on November 30, 1981. This is why I bow before the memory of my father: it is thanks to his example that I have always had a special interest in world peace. Since I took the helm of the World Taekwondo Federation in June 2004, I have believed that sport can and should promote world peace, which is the core ideal of both the United Nations and the International Olympic Committee. The goal of Olympism is "… to place sport at the service of the harmonious development of man, while also promoting a peaceful and better world." The importance of sport as a catalyst for peace and harmony can never be underestimated. Sport has the power to bring people together, bridge differences, and promote communication and understanding. The Olympic ideal behind developing sports is "to contribute to a better and more peaceful world by educating youth through sport practices without discrimination of any kind and in the Olympic spirit, which requires mutual understanding with a spirit of friendship, solidarity and fair play." This ideal has been the general guiding rule for the sports world for over a century. One effective way to do this is to utilize networks of relations with sport-related institutions, such as National Olympic Committees, International Federations, NGOs, the sports industry and U.N. organizations. Considering that the U.N. and the IOC share common principles and values, together they have the ability to use sport as a vehicle for the widespread promotion of peace and harmony throughout the world. I have long believed that Olympic sports can help young people, especially in developing countries and territories in need of help, realize their hopes and dreams and improve relations between people of all religions, ethnicities and genders. That is why I advocate, as a joint initiative between the U.N. and the IOC, the creation of a “Sport Peace Corps” – a project inspired by John F. Kennedy’s U.S. Peace Corps. I first unveiled my dream of a Sport Peace Corps in September 2007 at an international workshop on sports and peace in Leuven, Belgium and again in Monte-Carlo, Monaco at an international peace and sport forum in December that year. I also called for the creation of the Sport Peace Corps in 2008 at the 6th IOC World Forum on Sport, Education and Culture in Busan, Korea. On May 22, 2010, I proposed the creation of the Sport Peace Corps at the 1st U.N.-IOC Forum at the IOC headquarters in Lausanne, Switzerland, that would expand the scope of sports to involve all Olympic sports on a global scale. And I once again called for the establishment of the Sport Peace Corps at the 2013 SportAccord World Combat Games in St. Petersburg, Russia in October 2013. So what would this Sport Peace Corps do? How would it operate? What might it consist of? The Sport Peace Corps entails the provision of comprehensive sport-related assistance to not only underdeveloped countries, but also to any U.N.-assigned areas, such as refugee camps. The assistance includes providing equipment, skills and training for local athletes and coaches for any Olympic sport in countries in need. This gives hope and dreams to young people who are deprived of the opportunity to learn sport, while simultaneously promotes friendship, peace and understanding through sport and international interactions. The Sport Peace Corps project requires a group of volunteers consisting of coaches, athletes and physical educators to be dispatched following a period of training to serve assigned communities. In short, this project encourages participation of sport-loving people in the peace-building process. All of these efforts will promote the Olympic spirit and the United Nations' aspirations for peace. I believe that this is a win-win proposal for both the IOC and the U.N. since the project actively fulfills the fundamental principles of both organizations. To this end, the WTF is in close discussions with the U.N. and the IOC. In December 2013, the WTF signed a partnership agreement with the United Nations Office on Sport for Development and Peace, or UNOSDP, which aims to use taekwondo as a vehicle to promote the organization's objectives of promoting sport for all and peace. As a pilot program of the Sport Peace Corps, I, as president of the WTF, launched the WTF Taekwondo Peace Corps program in the summer of 2008. It was designed to instill positive values and discipline in young people - two factors that are key to living a life of virtue and honor. The Taekwondo Peace Corps is a platform where young athletes can not only improve their taekwondo skills, but also open their minds through cultural exchange, and in the process broaden and deepen their knowledge of the world, so that they can be a force to promote peaceful coexistence among the world’s nations and peoples. Each team is mostly made up of four competent taekwondo university students: three taekwondo masters, each of whom is a qualified taekwondo educator, and one person with language skills who serves as an interpreter. Since its first dispatch in the summer of 2008, about 1,300 volunteers of the WTF Taekwondo Peace Corps have volunteered in around 100 countries with great success. To further activate the program, the WTF launched the World Taekwondo Peace Corps Foundation in September 2009. The Taekwondo Peace Corps has been welcomed warmly and appreciated by each of the host countries, where they’ve lit up the dreams and hopes of young people. These pilot years have allowed us to expand our horizons with this project. The Taekwondo Peace Corps will continue with a twice-a-year, short-term dispatch for two months, and a mid- and long-term dispatch of instructors for six months to two years, targeting more recipients and a larger number of countries. The project will be expanded worldwide, based in as many countries as possible, and incorporate qualified taekwondo instructors of different nationalities. The success of the Taekwondo Peace Corps has been far-reaching. It has served as an example for International Federations, the IOC and the U.N, of the possibilities of a full-fledged Sport Peace Corps, which incorporates all sports – not just taekwondo. Based on our experience, I once again propose moving forward in developing a global Sport Peace Corps program. I call on all International Federations, IOC and U.N. institutions, as well as all networks of relations and sponsors to band together in making this a reality. The Sport Peace Corps vision has the potential to provide sportsmen, sportswomen and their coaches with the inspiration to serve humanity. The vision, if realized, can grant hope, optimism, physical health and confidence to young people in all parts of the world, particularly those who suffer from material deprivation. Working together with the global Olympic families, the WTF will continue to work tirelessly to better serve all of humankind through sport. The WTF is truly committed to serving mankind through taekwondo as a sport for all.